“> a magnificent prize table……….. 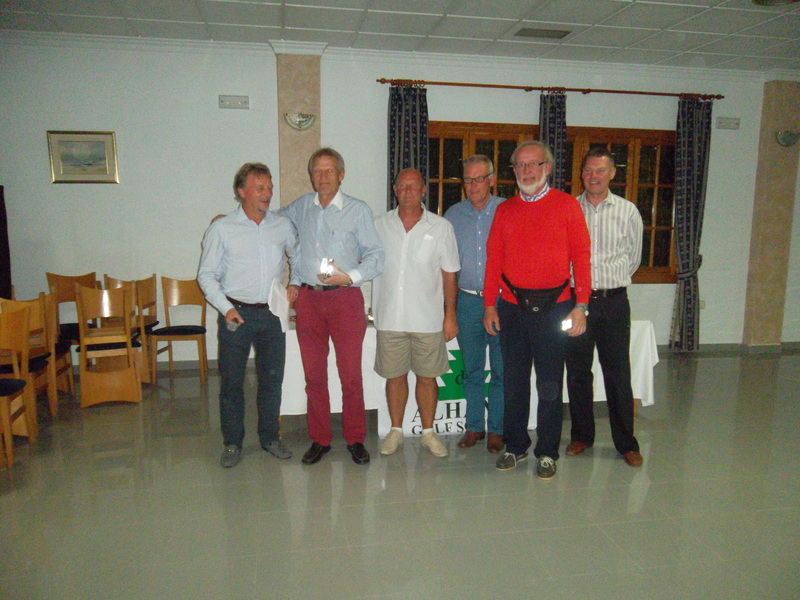 This week was the seniors trophy, for players 55 and over. We had 56 players, 40 of them in the seniors. 8 ladies took part and we had 11 guests. The weather was fine, now cooling down at the end of the summer. Rain did sweep across Condado later, but it was about 3 hours after the last players came in. We have had several downpours over the last 4 weeks which has been good for the course and the lakes. Many of the norwegians travelled home today, not by longboat but ryanair etc, with their plunder. They did leave a small raiding party however, who managed to create a lot of damage before sneaking off with many of the prizes. 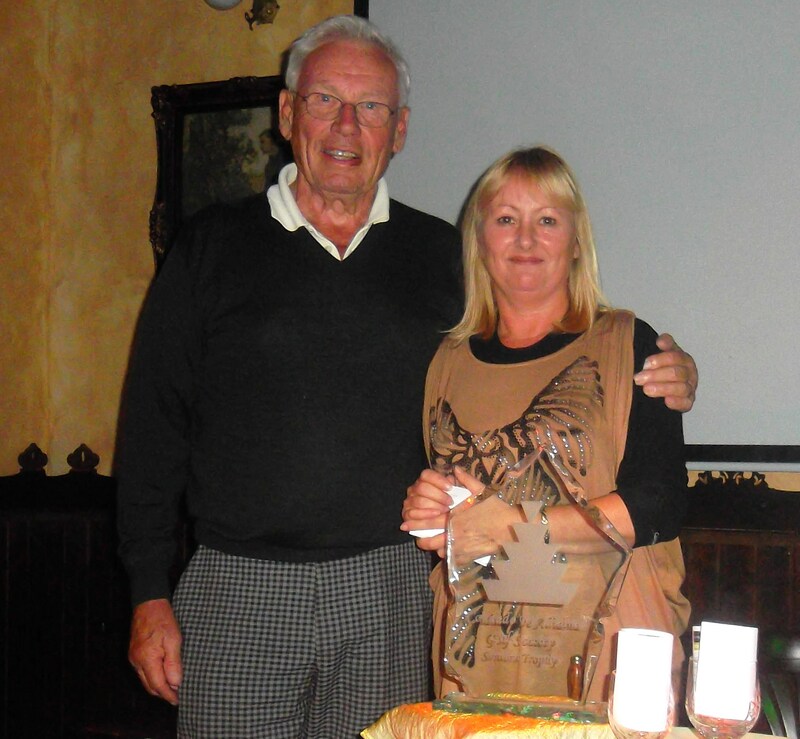 Seniors trophy and 2nd division winner Arne Schmidt with Cath……………..
Paul was runner up but won the 1st division……..
Karin Dahl was unlucky to let another trophy slip from her grasp – on the 14th she saw Jim Alwell on the next fairway and waved to him as she went along. Unfortunately she took her eye off the ball (for once) and ran over her own ball with her trolley which incurred a penalty shot (she lost the ladies prize on countback). 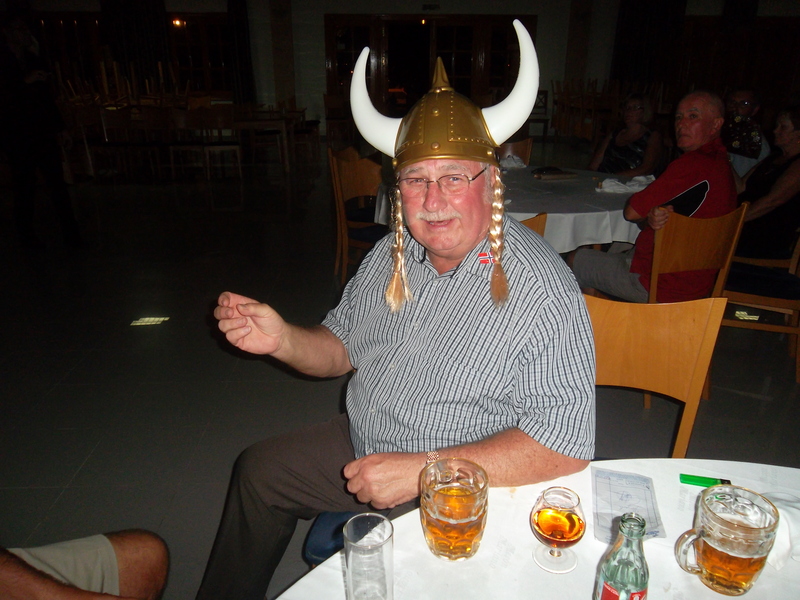 Arne is a new player to our ranks, and we will have to keep a keen eye on him after his 2 victories in the viking cup and seniors events this week. Click on link below for more photos. Thanks to Sandy and Dorothy Simpson for donating the seniors trophy last year and providing the beautiful momentos again. 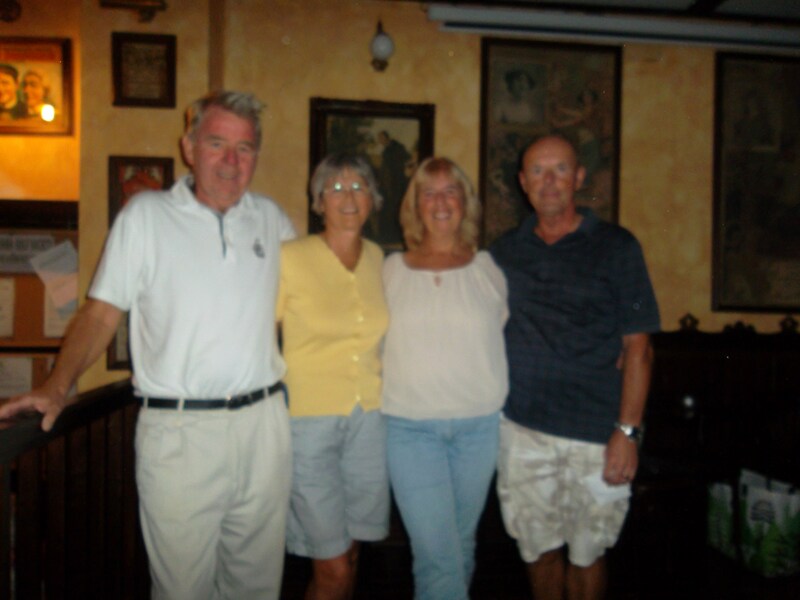 This year they were unable to attend due to Dorothy having a hip replacement only 2 days ago. Everything went well, and we hope to see Dorothy back on the fairways in the new year, this time being able to tee up her ball and retrieve it from the hole with no outside help! At their request, Cath presented the prizes. 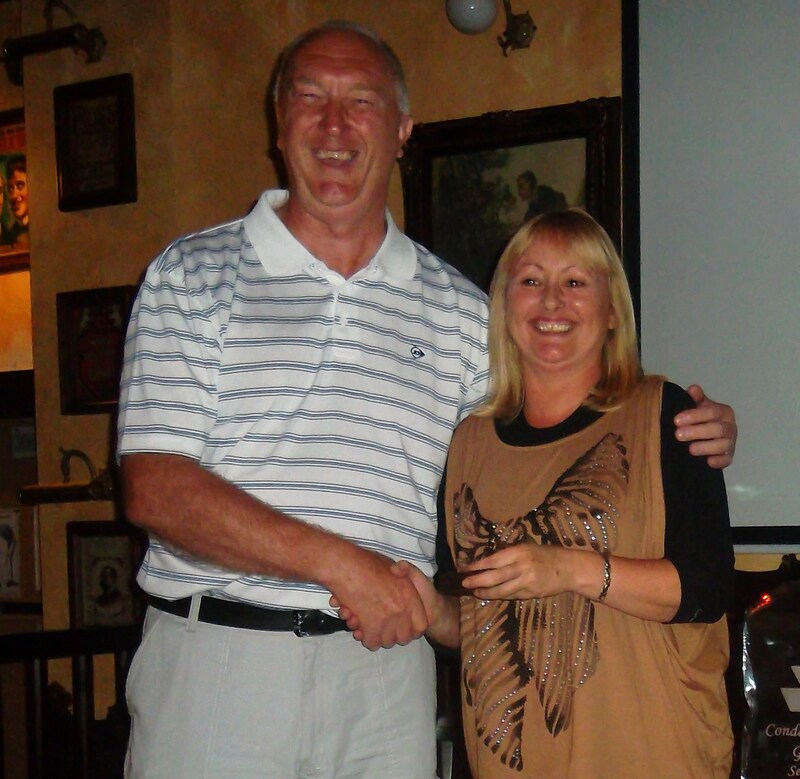 Whilst on the subject of thanks, we recognise the help we get from Neil and Lynne in the Clover. With entries recently about the 60 mark they have provided a mountain of sandwiches (various fillings) at the 5pm presentation. The shots donated for 2’s have not gone down quite so well as many winners find this a punishment! Friday was the official opening of the clubhouse with many visiting dignitaries attending. Unfortunately it took place whilst our 57 players were out on the course, and I was on a plane back from the UK so couldn’t take photos. 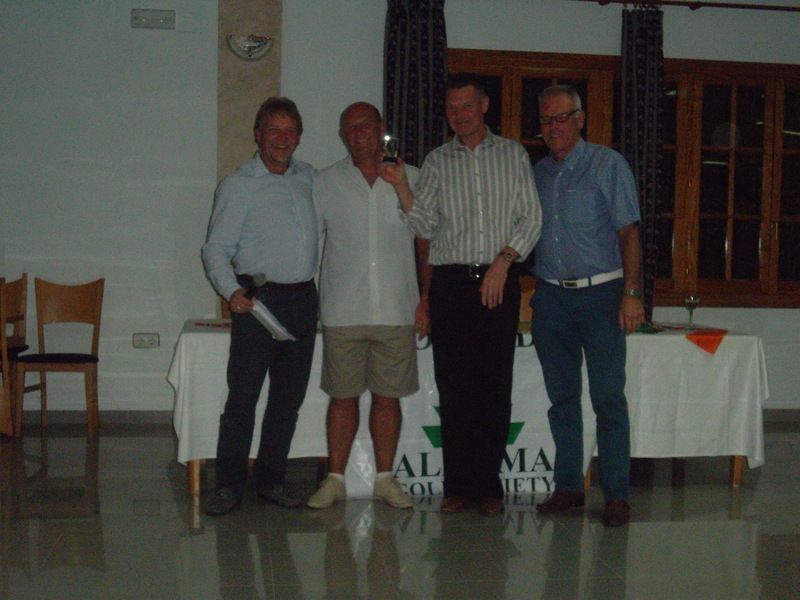 Saturday Global Golf and Alhama council staged a tournament open to all. It was a shotgun start and I was there to get a bird’s eye view. When the first bang went off I wondered why no one teed off – then another bang and still no movement. A few seconds later there was an enormous explosion and I saw the rocket streaking off into the stratosphere (the first 2 were spanish gunmen after game on their weekend break). Players then duly teed off, but within a couple of seconds I heard another bang – the fusilage of the rocket landed only 2 feet away from me! Luckily I am here to write the report after narrowly avoiding the space debris! Almost as good as Paramount opening?…………………………. Before the big bang – players waiting to tee off on the 1st……………..
For more photos of the clubhouse competition click below………….. The golf professional for Global Golf is Javier Garralon, and this week he has posted me an amazing offer. 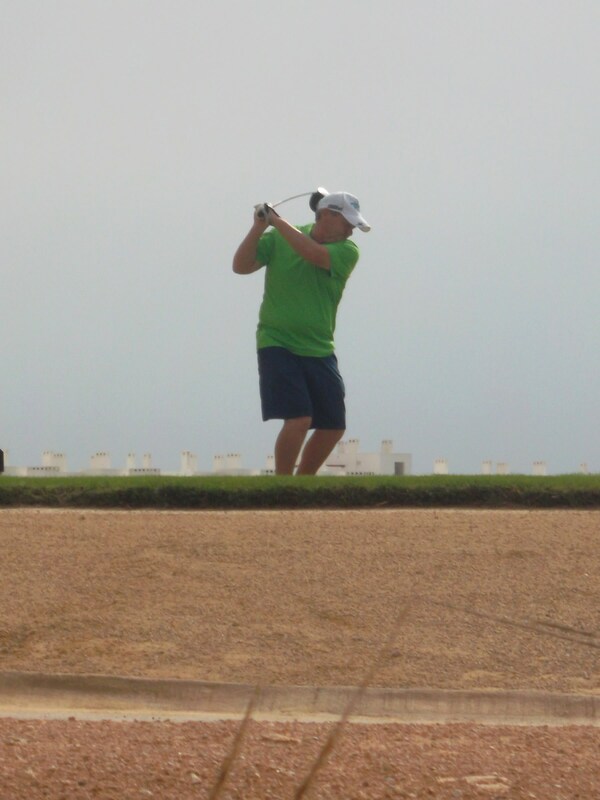 He is willing to provide 2 8 1 hours group golf lessons free of charge to beginners. The golfing widows should take up this offer and see what all the fuss is all about! It is aimed at novices who need to get the basics (which we have all mastered of course!). I will give dates and times when I can with information regarding dates and times etc. We all get the weekly newsletter from Mileniun and sometimes the news is boring (which lights have been repaired, which lawns have been cut etc.). This week though, they have included photos of the clubhouse opening, and especially interesting is an aerial view of the resort. 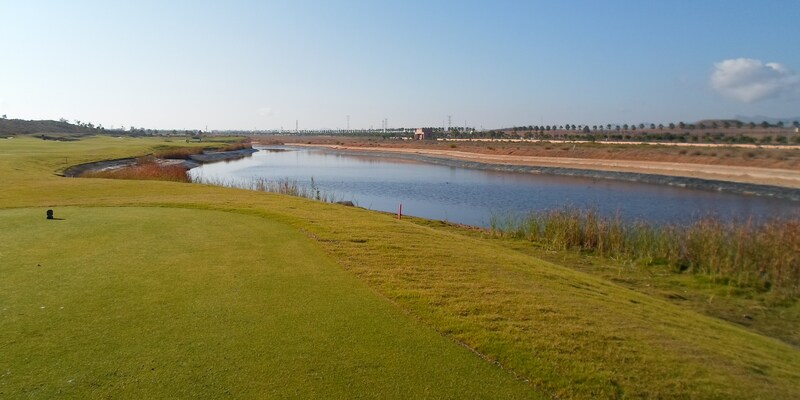 This shows a view of the completed course – I think it is recent because the lake on the 5th is not blue as the other lakes are. I have a photo from 2008 showing the course as a sandbowl and the difference is amazing. 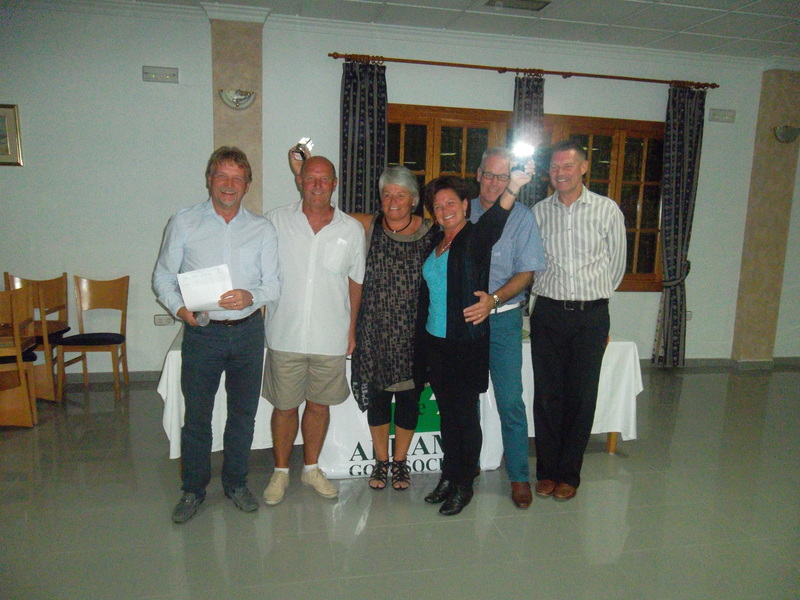 Monday November 5th is the Mar Menor challenge at Condado. 20 players per team (sheet now full). 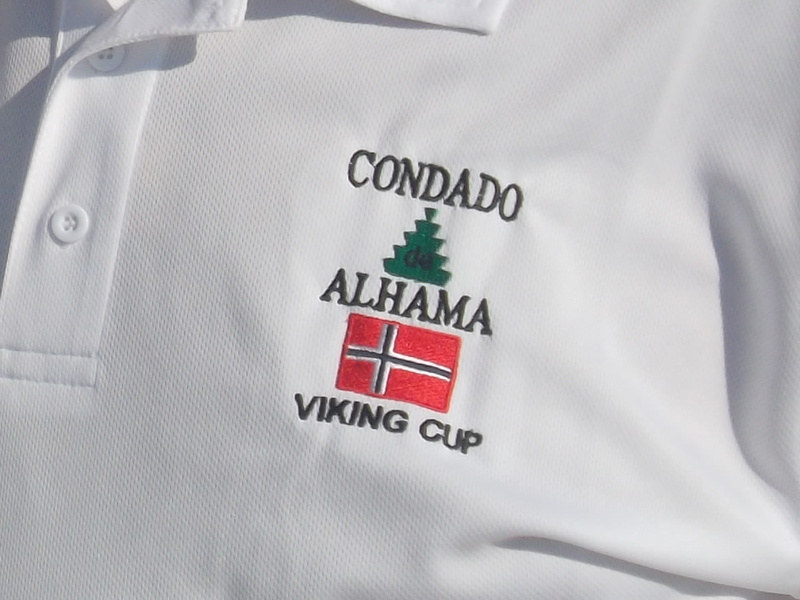 We are away in Benidorm for 3 days from tomorrow but I will provide photos of that and more from the viking cup on my return. NORWAY & SCANDINAVIA RETAIN VIKING CUP! 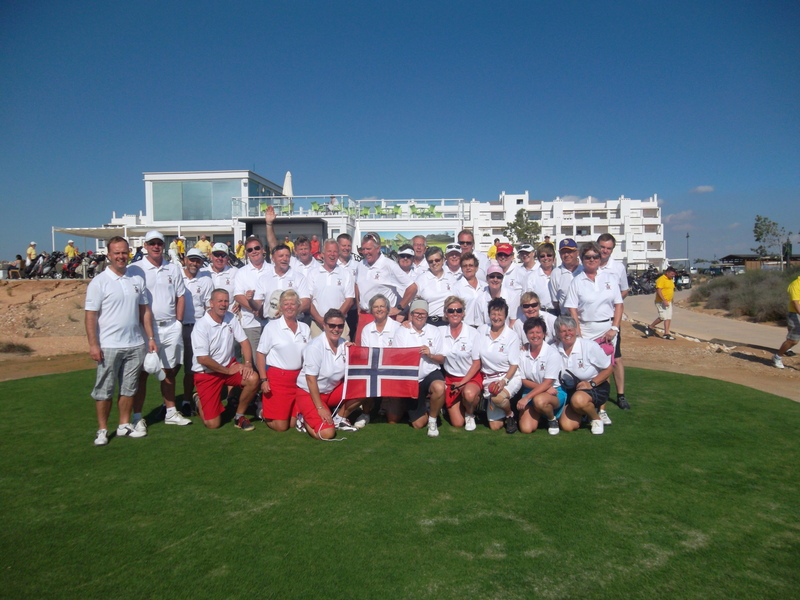 72 players from Norway & Scandinavia and UK & Ireland battled out a close contest for the 3rd playing of the Viking Cup. All players began play with a shotgun start, and about four and a half hours later the cup was snatched from UK & Ireland’s grasp with leads being lost on the last green in 2 of the 18 matches. The top 28 scores from each team were taken into account. This was very close in the scandinavians favour (836pts to 831pts), and in addition each match had 10 points at stake for the winning team (Norway 105pts UK & Ireland 75pts). So the overall result was Norway & Scandinavia 941pts, UK & Ireland 906pts. The Scandinavians looked very smart in their white shirts (sponsored by Bjorn Spieler) and UK & Ireland also looked good in the bright sunshine yellow society shirts. 2013 shirts (in green) are now available from Kev & Cath (photo shows we have them in more than one size!). Half an hour before the 9.30am start the range was quite busy, mainly with norwegians. 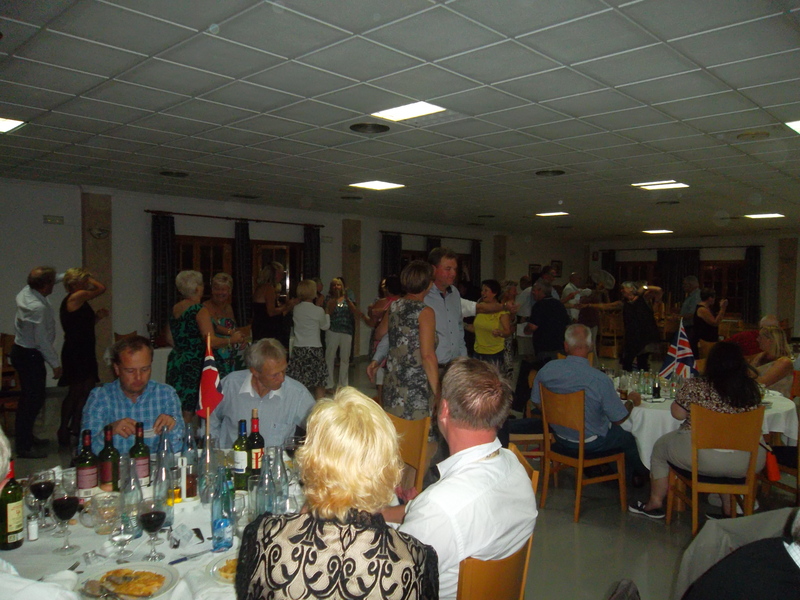 The norwegians look good in their team shirts………………..
At night over 100 players and guests partied at Mariano’s restaurant in Camposol and as you can see, all had a great time. The prize table, with many of the momentos being sponsored by Jan H Olsen. 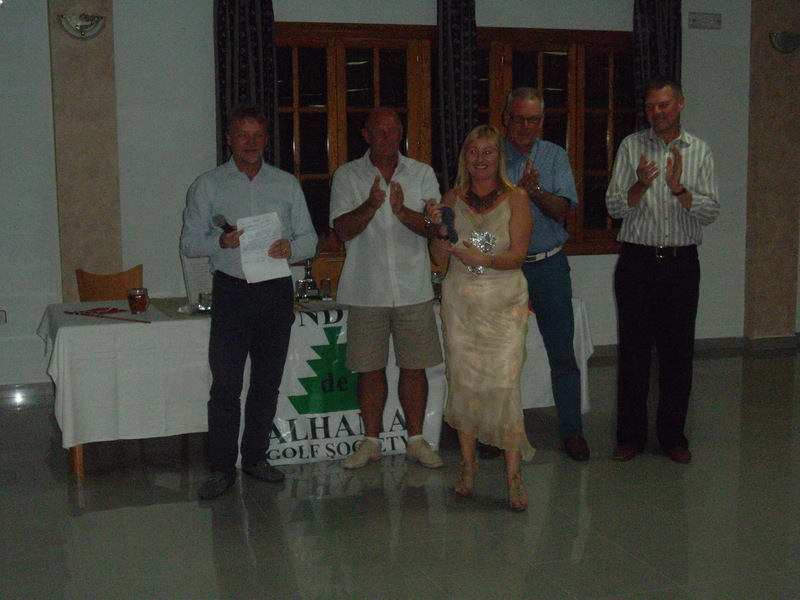 This was the moment that the winning team was announced – Karin is quite a strong girl…………..
1st place in pairs were Ken & Alicia Saunders (68pts)- Well done Ken finally off that 28 handicap! 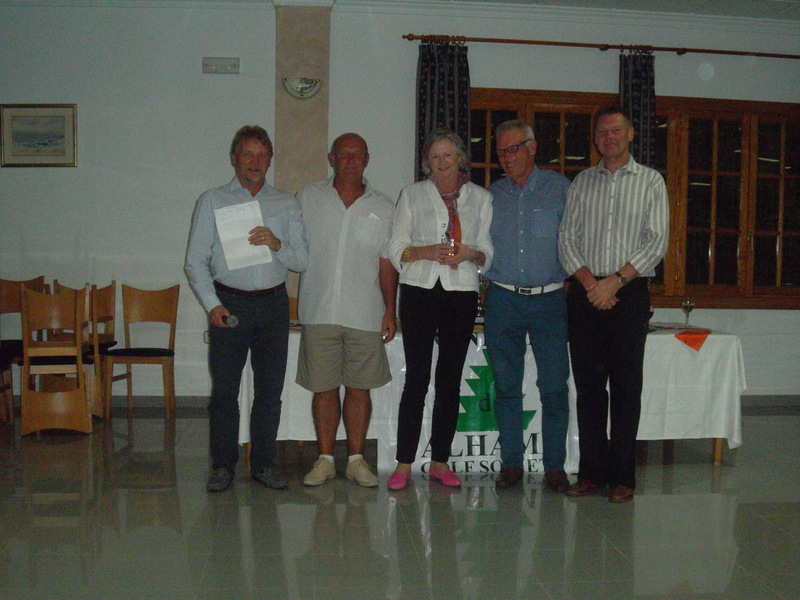 3rd place pairs were Karin Dahl & Mona Larsson (66pts)………….. 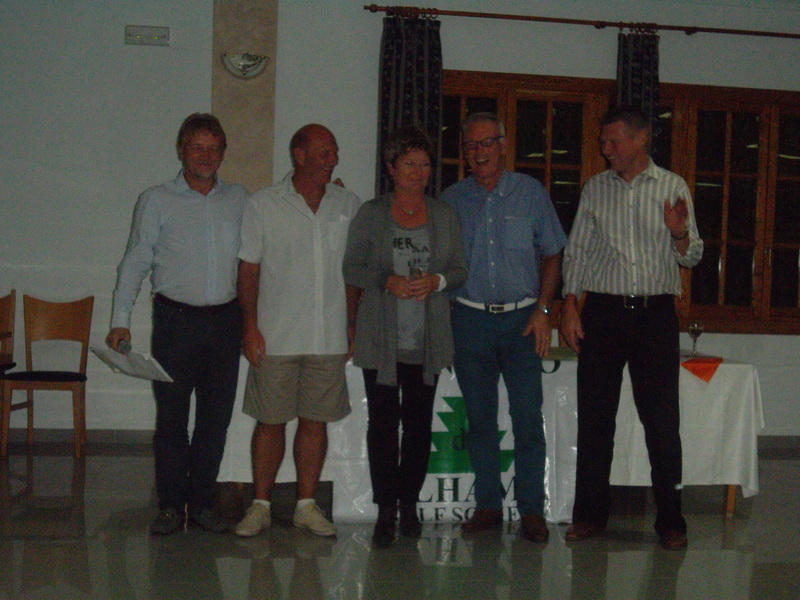 Thanks to the organisers who enabled us all to have a great day (Dave Lloyd, Jan Skold, Graham White and Jan H Olsen). 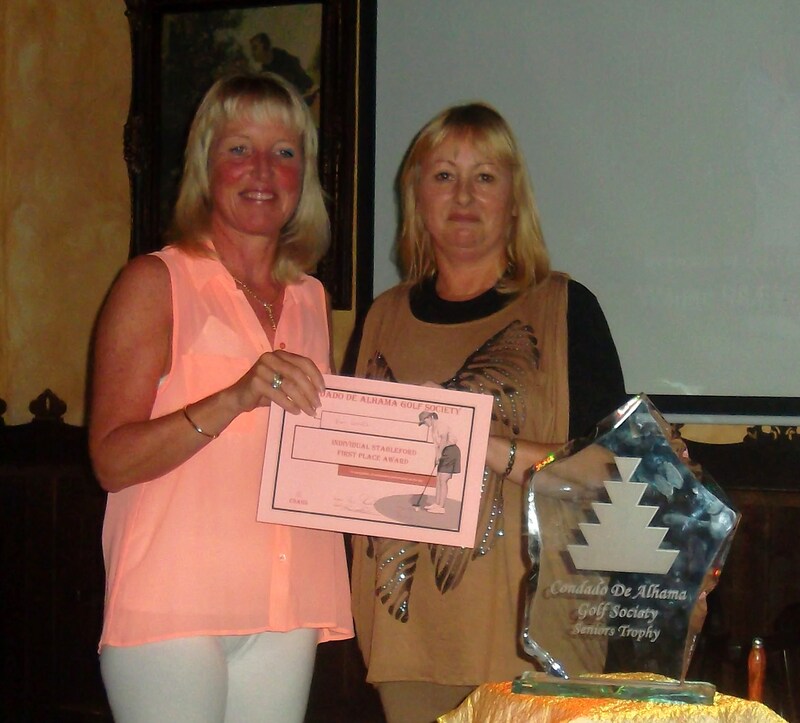 Cath was also recognised for all the work she had put in to make the evening a great success. 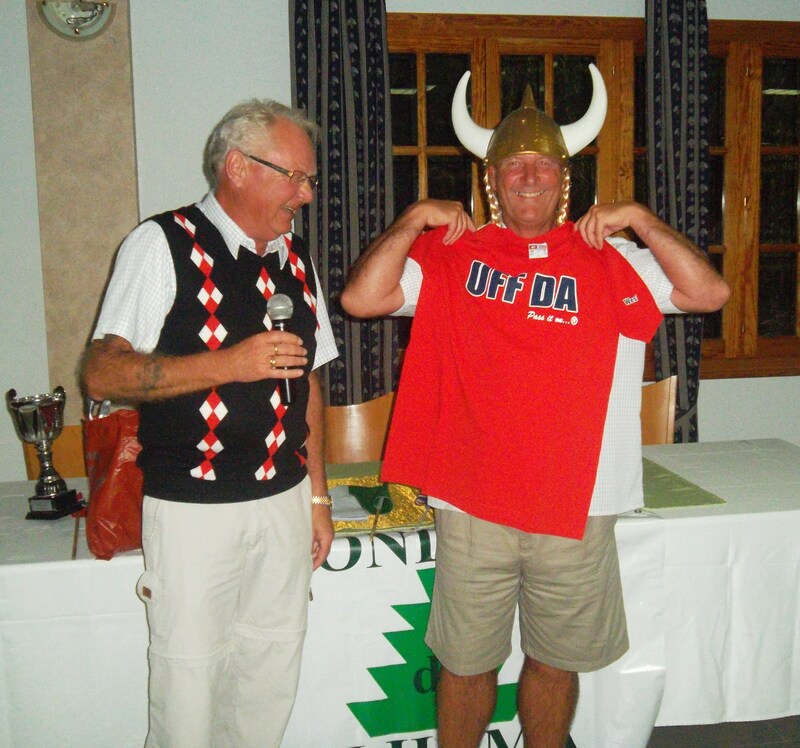 Dave Lloyd was also presented with a viking helmet (complete with pigtails) and a norwegian t-shirt (very fetching!). Barry Answer tried on the helmet, and I must admit he looks like a ferocious invader from 1000 years ago! 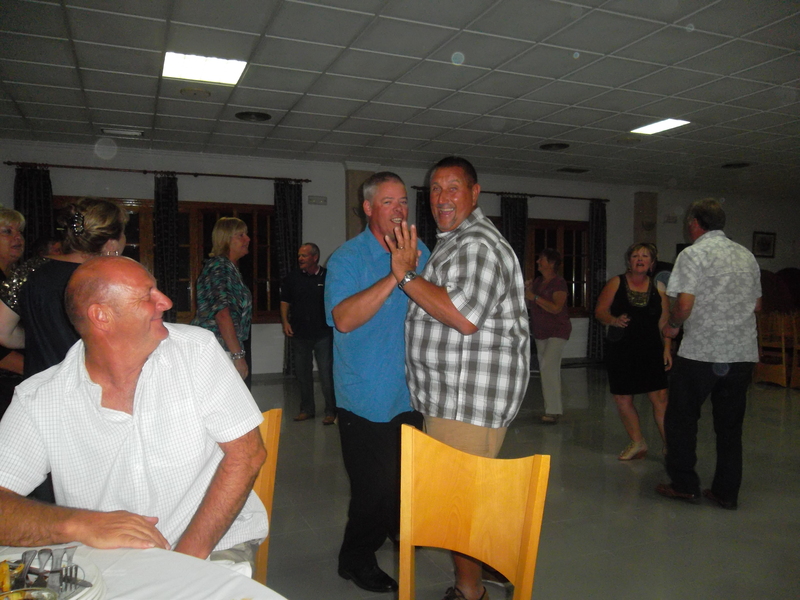 It was a full house, with everyone dancing to the great music of Woody……………………. 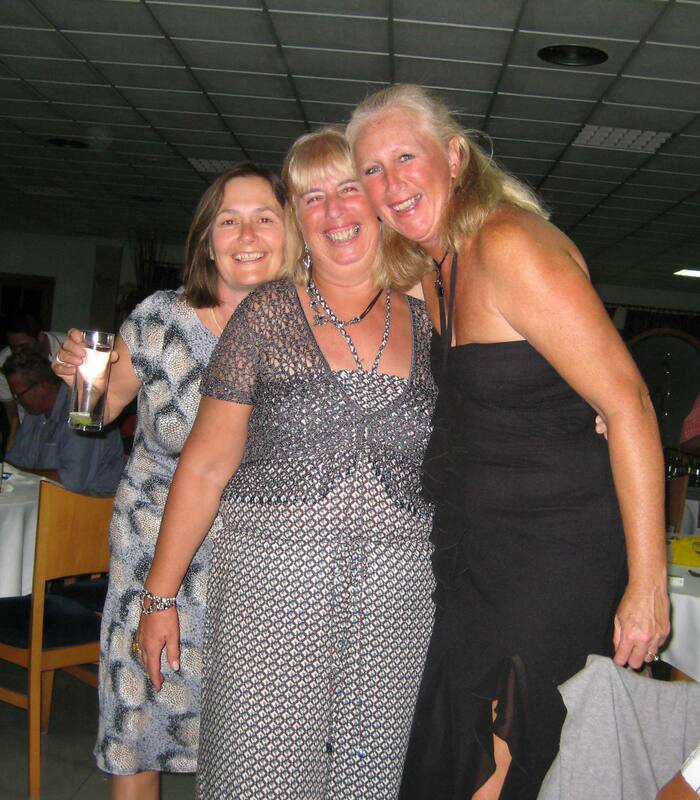 The girls had a great time – the 2 Lesleys and Alicia………..
Sausage Dave looks to have recovered from his last hole meltdown………………..
Les and Phil make a lovely couple………………….. I will post more pictures of the pairs and other photos later. A dismal start but the expected rains did hold off until about 7pm. Reparatition of the bunkers from the recent rains is now almost complete. The greens were running at competition level (>10 on stimpmeter). Work is now taking place on the tees with many covered in sand. This meant that the mens tees were off whites on 7 holes, and reds (or further up the fairway) on 5 holes. It was quite interesting to play the course from these positions. Some good scores again from the 72 competititors (18 teams of 4). Global Golf (and the banks) are very pleased with bookings. Monday October 15th was a record with 724 bookings at their six courses. 92 of these were at Condado. As a result of this increased interest 4 more greenkeepers have been employed. For anyone needing clubs during their visit I have been informed of a cheaper option to bringing your own. Paul McGinley (Ryder Cup vice captain) offers a service where you can collect hire clubs at the airport when you arrive. Price for set of clubs and bag is from 35e per week. One example is a set of Taylor Made R9 at 45e. Shoes can also be hired from 10e. Available at several airports including San Javier. Check out http://www.clubstohire.com. The new diaries for 2013 are now on site – please collect one for next years fixtures. Also we have the new green shirts for 2013 available. Kev models the new shirt. The vikings are now here in readiness for Tuesday’s big challenge match. 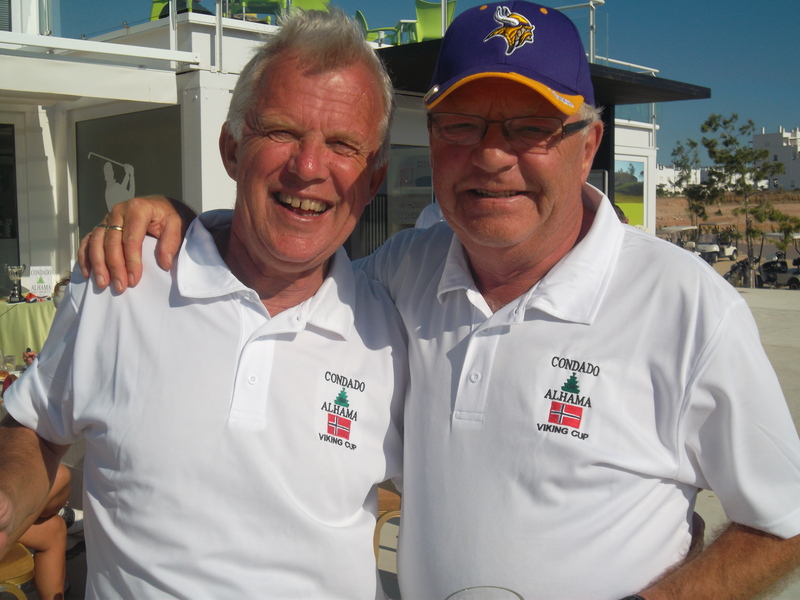 They will all wear white shirts which have been sponsored by Jan H Olsen. Can UK & Ireland players try to wear the yellow society shirts or something similar. We already have a sponsor for our shirts in 2013. Dave Lloyd will be in the clubhouse between 1.30 and 3.30 on Monday to collect green fees – 8 euros for course members, 39 euros for walkers and 45 euros for players with buggies. He will have the pairings available at that time. The format is as last year. There will be 10 points at stake for each match (5 points each for a halved match). This is decided by totalling the stableford points for each pair. 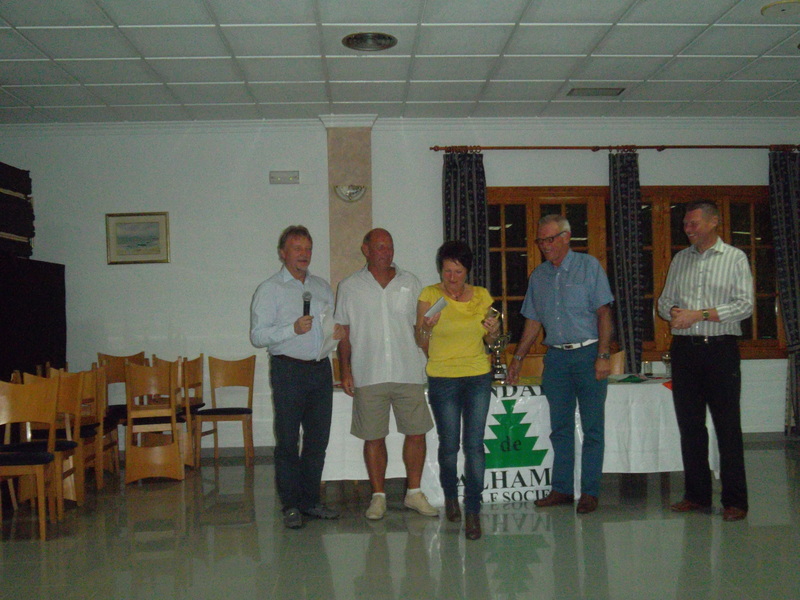 Also the best 28 stableford scores from each team will count along with the 10 points available per match. There will be a post match drink and tapa at the clubhouse for all players but please remember to bring your ticket or you will have to pay. 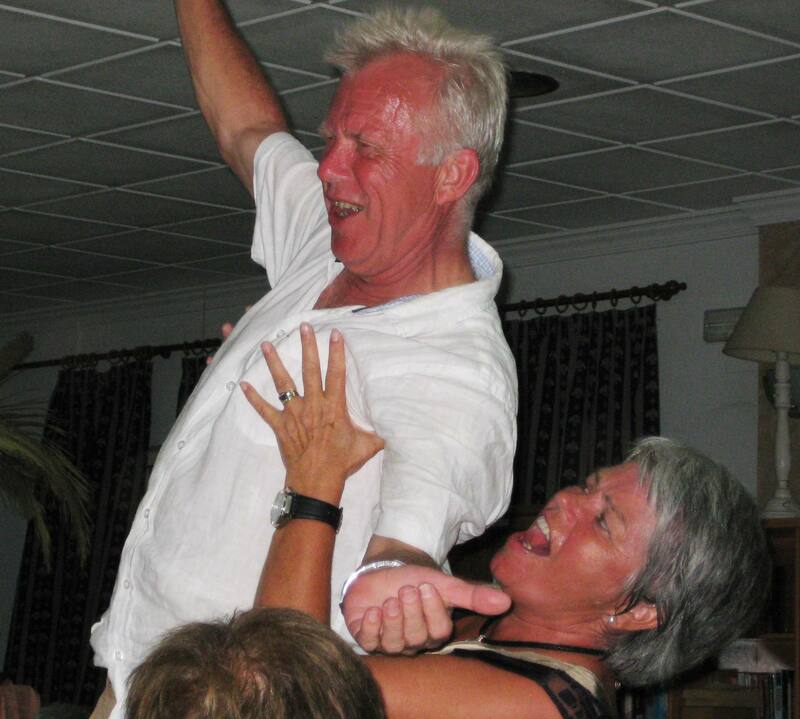 Friday is the Seniors championship (plus stableford for non seniors). Saturday is the Global Golf competition with a shotgun start at 9.30am. 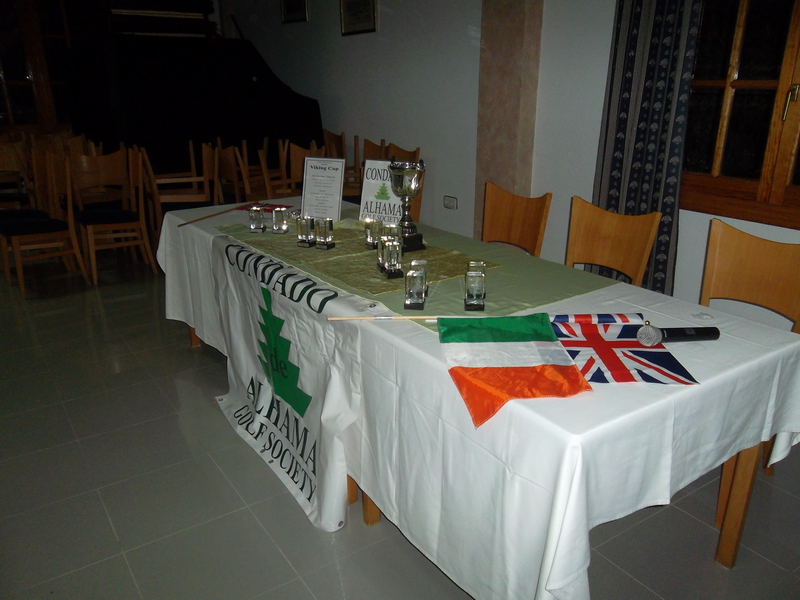 It is 25 euros for residents and please enter your name at the clubhouse shop. Well, just back from a weeks cruise in the med, and although I have been praying for rain all summer, I just didn’t want it last week. Had 3 days of rain and one day of 100 km headwinds which blew the water out of the pools. However, I am glad to be back home in sunny (and warm) Condado and looking forward to a couple of hectic weeks of competitions. Friday is a 3 person team event with over 60 entries before the Wednesday night roll up. Then it is the Viking Cup on the 23rd (Already full with 72 players and a list of reserves). Friday 26th is the Seniors trophy for players 55 and over, along with the normal stableford event for the young ‘uns. On the 27th it is the inaugral tournament to celebrate the opening of the clubhouse (sponsored by Global Golf). This is followed on the 29th with our 3 day golf trip to Benidorm. 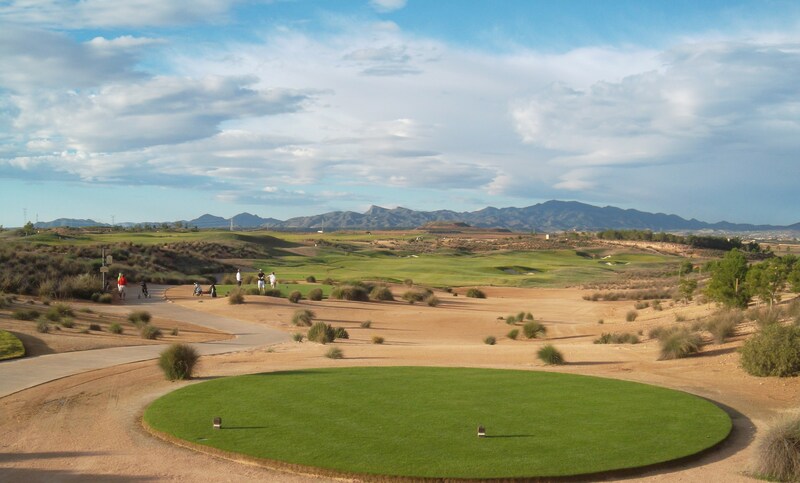 Then maybe we can settle down to some quiet winter golf on one of the best courses in south east Spain. 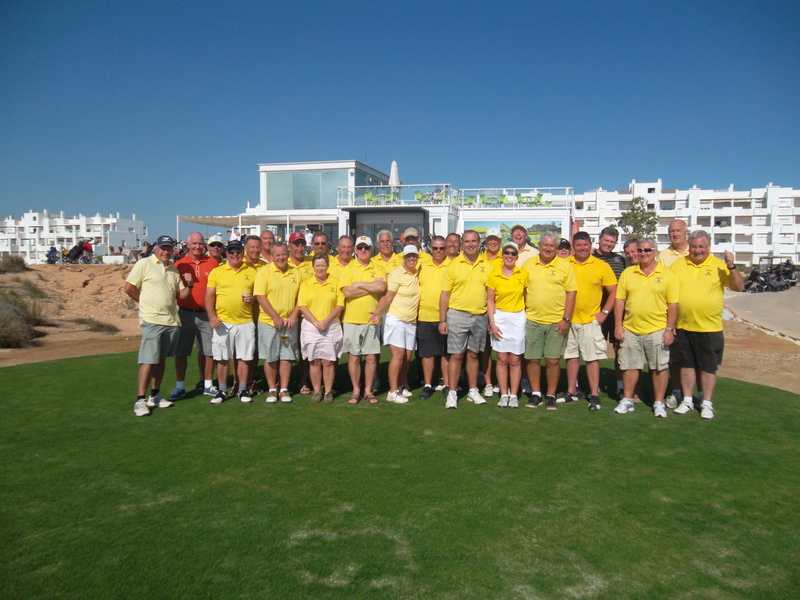 Last week was the Ryder Cup tournament staged over 2 days at Aguilon golf. 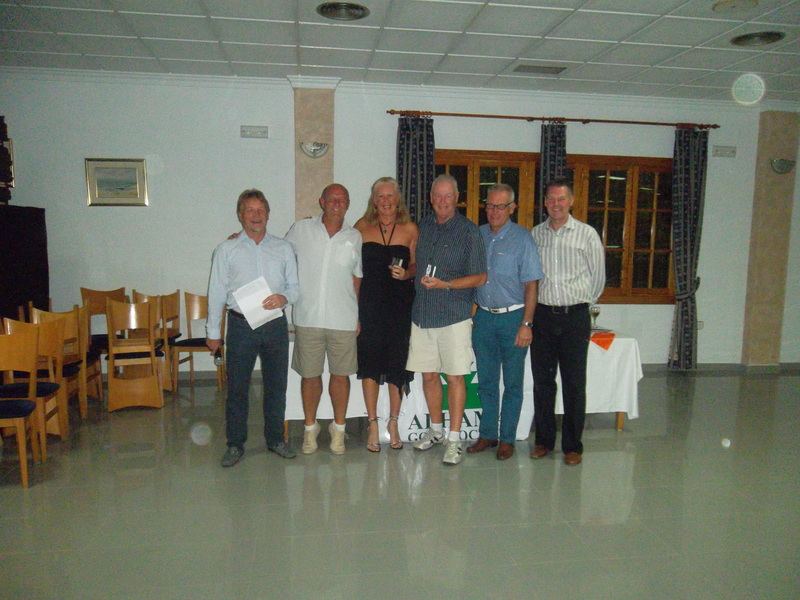 Dave Lloyd was one of the European team and has submitted an excellent report. (See link at top of page). Thanks a lot for that Dave I am sure this will have raised the profile of the tournament and it will be well supported next year. 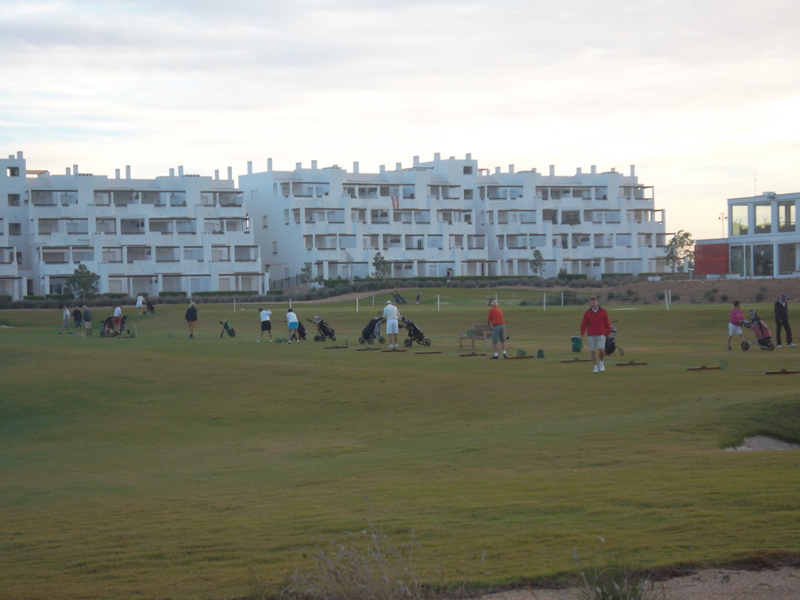 This week we had Ideal golfing conditions, the rain that was forecast did not appear until 7pm that evening. We had 50 players this week, with some very good scores coming in, the men had a slight advantage this week as a lot of the yellow tee boxes was up with the ladies, this due to the boxes being re-seeded. A very big thank you to Steve from Apollo Air who has again sponsored this monthly trophy for the next 12 months. We are now just over a week away from the Viking cup and the Norwegian team is starting to arrive, can I please ask everyone that is playing that if you are attending the evening presentation to please let us have your meal choices and if you require transport. The ticket prices are 20 euros and it inc, drink on arrival at Mariano’s, 3 course meal, entertainment, transport, and post match drink and tapas, contact cathkevin123@hotmail.co.uk. Friday the 26th of Oct is the seniors trophy, (Sheet now in shop), can you please indicate on sheet if you are taking part in the seniors (over 55). This will now be played on Condado as the pro tour event has been cancelled. 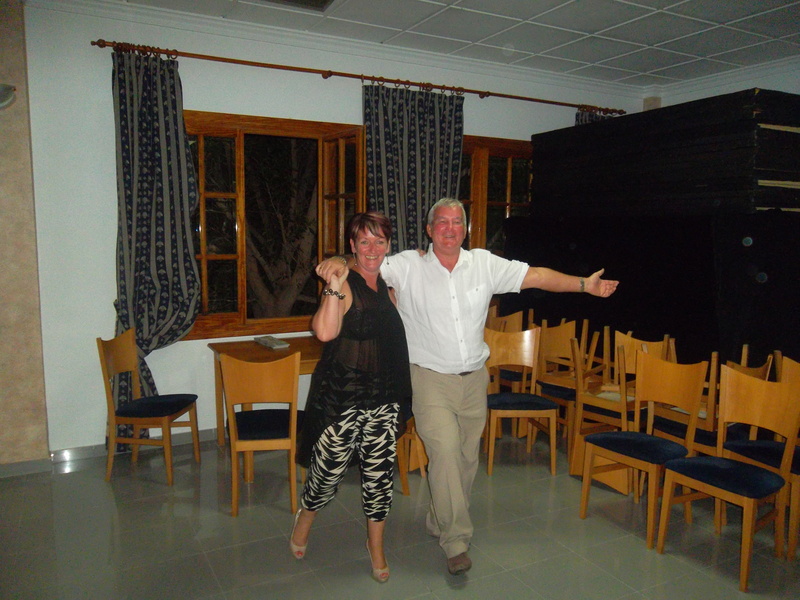 Also on this Friday Global golf have the official opening of the club house, and on the Saturday 27th have a composition which they have sponsored, its 25 euros to enter there comp for Condado residents, if anyone would like to take part please email me on cathkevin123@hotmail.co.uk. We now have the new green shirts for 2012/13 same price as last year (15euros), the Condado club and clover have now put there names on the sleeve. Also next years diaries are now with us. Barry has been away on a cruise this week lets hope he has had a good time and will be back doing the blog next week. This week was a 2 person texas scramble with an excellent entry of 48 players. No problem with the weather this week with lovely sunshine again. The greens have now speeded up following the hollow tining. Again scores were close with only 1.4 shots separating the top 4 pairs. After David Wareing getting the title ‘Sausage Dave’ we now have a rival – Robert Beaton provided the bacon for his team and he is now ‘Bacon Buttie Bob’. Had a chance to discuss a couple of points with the Alex the head greenkeeper this week. I commented that the placing of the red stakes (water hazard markers) on the 4th hole are unfair. A player is already penalised one shot for dropping out of the hazard, and then finds he/she must drop within 2 club lengths and is still on the steep bank. (Please note all players you are only allowed 2 clublengths for a penalty drop and one clublength for a free drop). Many times I see players dropping on the nearest flat spot which sometimes is up to 10 clublengths away! I suggested moving the posts higher up the bank so the penalty drop could be taken on the flat. This was refused as it was a deliberate design by Jack Nicklaus. On this occasion I cannot agree with the great man. The 2nd point was the dried up lake on the 5th. Players are walking into the middle and playing their shot (you cannot ground your club in a hazard though). There is a chance that the lining of the lake could be ripped. I suggested that the lake should be GUR (ground under repair) until the lake is filled. On this point Alex agreed with me, stating that repairs to the lining would be very expensive. He thought this should be indicated by placing blue posts around the lake. We shall wait and see if this happens. We were disappointed to find out that no buggies will be available to us this coming Monday and Wednesday. This is due to a visiting party arriving. We play every week and Global Golf should at least reserve a couple for us. 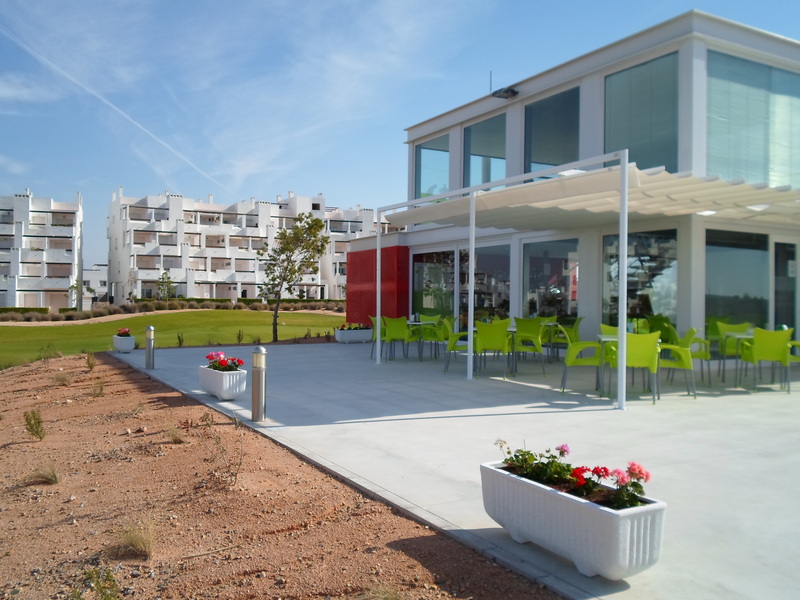 As you can see from the above photo, planters have been arranged around the clubhouse terrace, and make the clubhouse experience even better. I spoke with Javier the Global Golf professional yesterday. He informs me that he will be on site EVERY Tuesday, Thursday and Saturday (not just when he has enough customers as we previously thought).He is very experienced and can help players of all abilities, although he would like to introduce more beginners to the game. There is a 25% discount on published prices for society members. IRM are making a determined effort to raise the profile of the Signature Course, so we will have a professional on site and the course will be marketed differently. 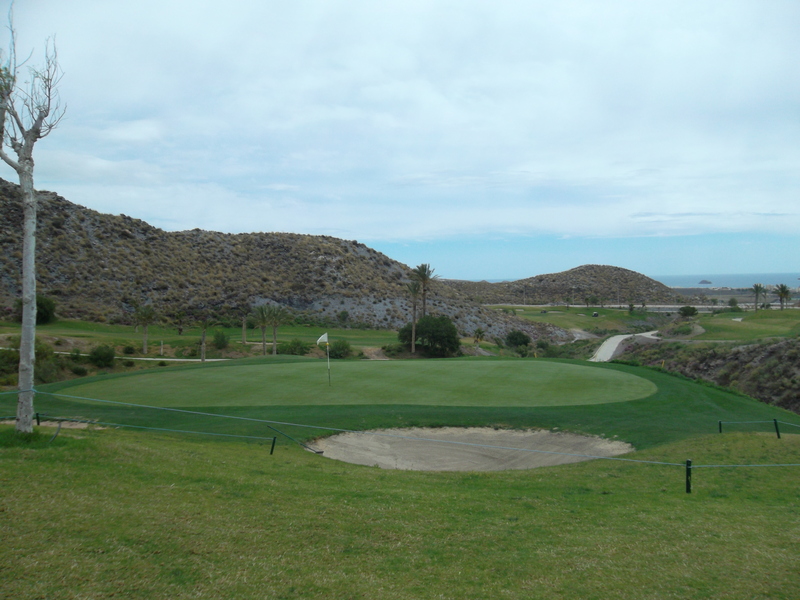 We shall be advertised more as a premium course rather than as one of the 6lobal Golf trail. Friday and Saturday (October 26th & 27th) is the official opening of the clubhouse. 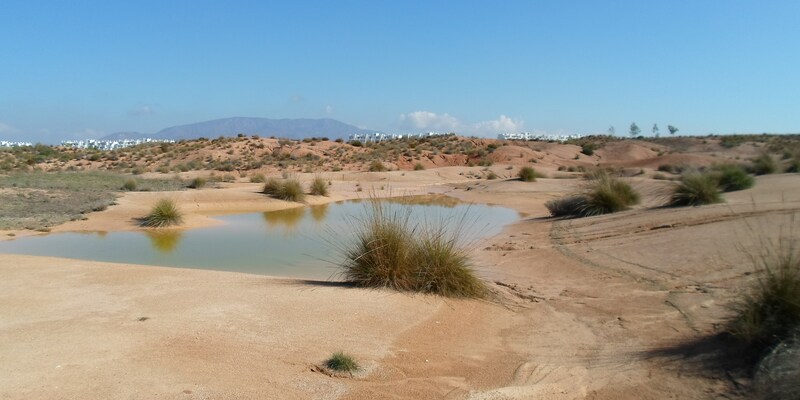 The competition is Saturday and is 25 euros to enter for residents of Alhama. On Thursday Ken Saunders reaches an important landmark with his 60th birthday. Congratulations Ken – have a great time. Some of next years diaries have arrived, and the rest will follow soon. Also the new green society shirts for next year are also here. Again a reminder that you need to book with Cath for the Viking Cup night event. 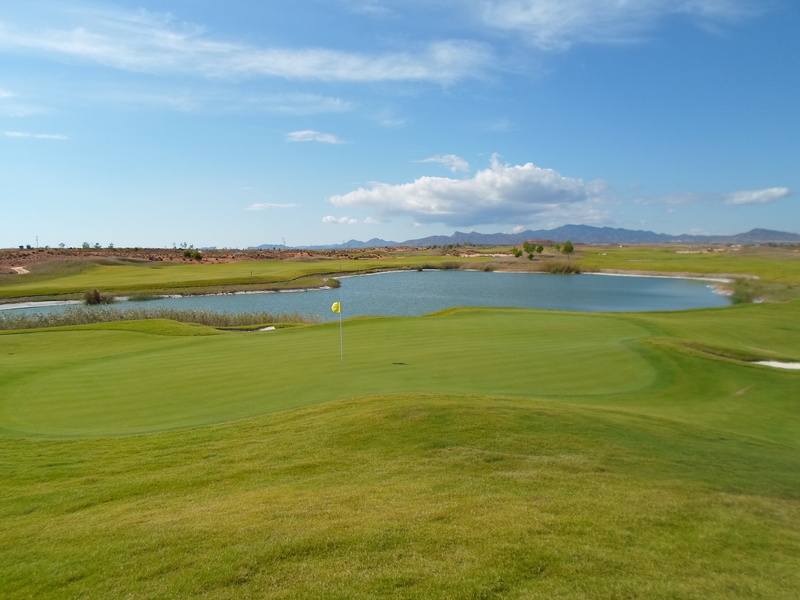 can’t play out of the dry lake bed on 4 this week…………………..
greens are good and water level is a little higher……………. I have now found time to go out onto the course and see the effects of the gota fria which hit us on Friday. The damage is nowhere near that of 2 years ago, possibly because the greenstaff left all the previous channels in the hillsides and filled them with stones. Also work must have been done on the bunkers, which although damaged, did not have all the sand washing onto the fairways. There is still much work to be done to put the course back into condition, but work has already started. 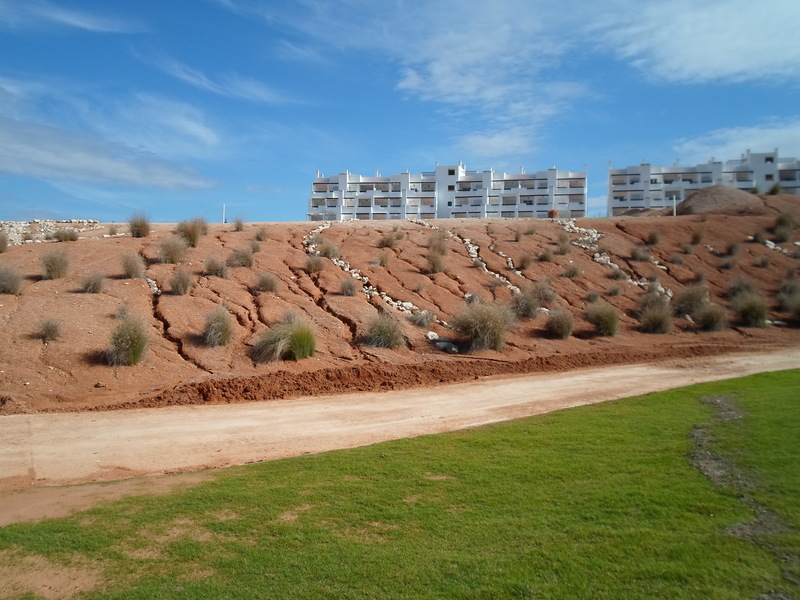 Sand that has been washed from the hills onto the buggy paths has been removed to the sides. Work has started on repairing the bunkers, which may only take a couple of weeks this time. It took about 8 weeks last time to repair them. Fairways and greens are fine, with only a small amount of debris washing from the rough onto the fairways. Still quite a few pools of water where they shouldn’t be, even dips with a drain at the bottom are blocked with sand. I think we have escaped lightly though. A couple of weeks and we should be OK. The path between the pro tee on the 8th and 10th is a mess…………. 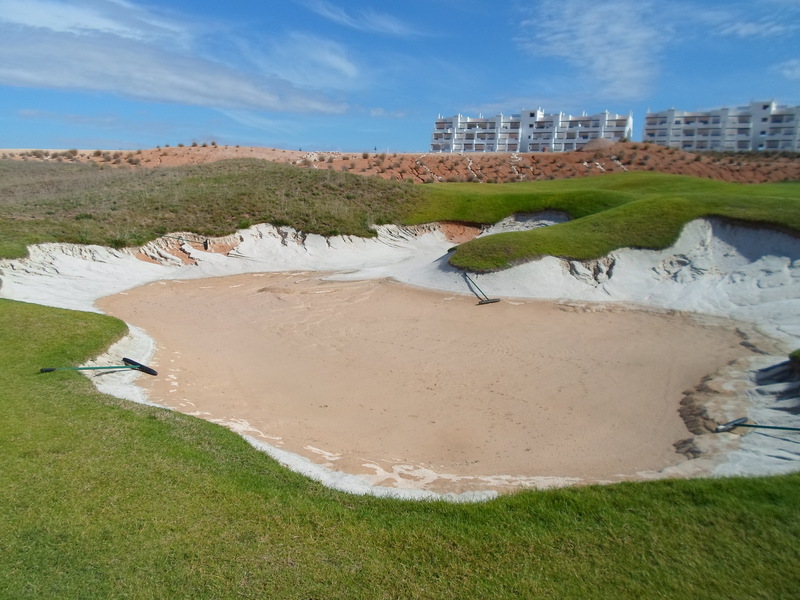 Lots of bunkers have this kind of damage……………..
We got the wrong information from Global Golf about the Evolve tour itinery in October. Their pro event will go ahead from October 24th – 26th. Their normal practice day on the 23rd will not affect the Viking Cup scheduled for that day. The tour are happy to put their players out after we finish. They had also booked the course for the previous week, but that is the event that is postponed until later in the year. So the society Seniors Trophy planned for Friday October 26th will have to be played on another Global Golf course (all normal society rates will apply). The evening celebration of the Viking Cup will be at Mariano’s on Camposol A. This will be 20 euros but will include transport, a pre meal drink (to avoid queuing), entertainment from the fantastic Woody. Also included will be a snack/drink on the clubhouse terrace as we all finish our golf. (Shotgun start means we all finish together). Both teams now have 36 players and latecomers will have to settle for a place on the reserve list – it is a very popular competition). 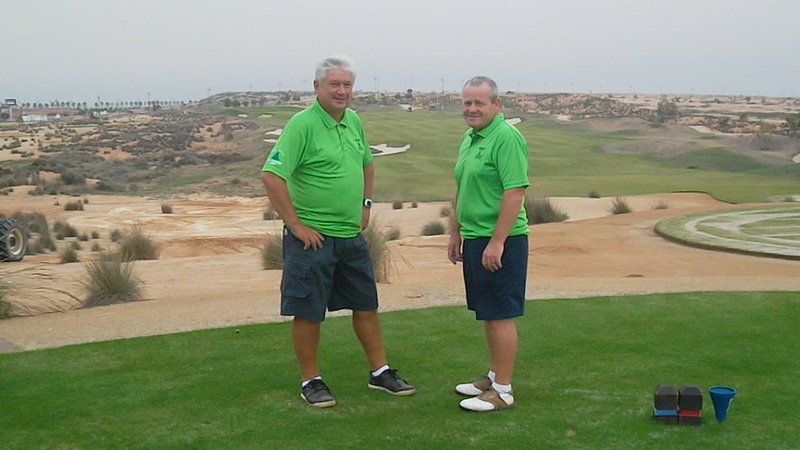 There is some news from our meeting with Global Golf management. 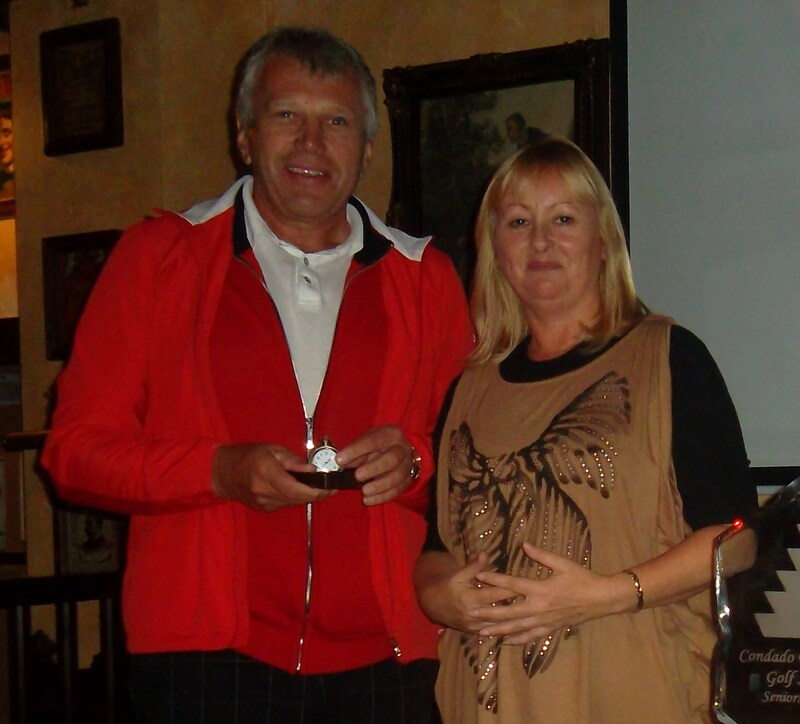 Neil Simpson (Clover) will organise the inter-society Open on November 7th. GG will provide details of societies they are aware of, and we hope t0 have 12 6 person teams (societies can enter more than one team). Again a shotgun start with 72 players. Global Golf will provide a trophy and 6 replicas. This should raise the profile of the course and bring in more repeat visitors. 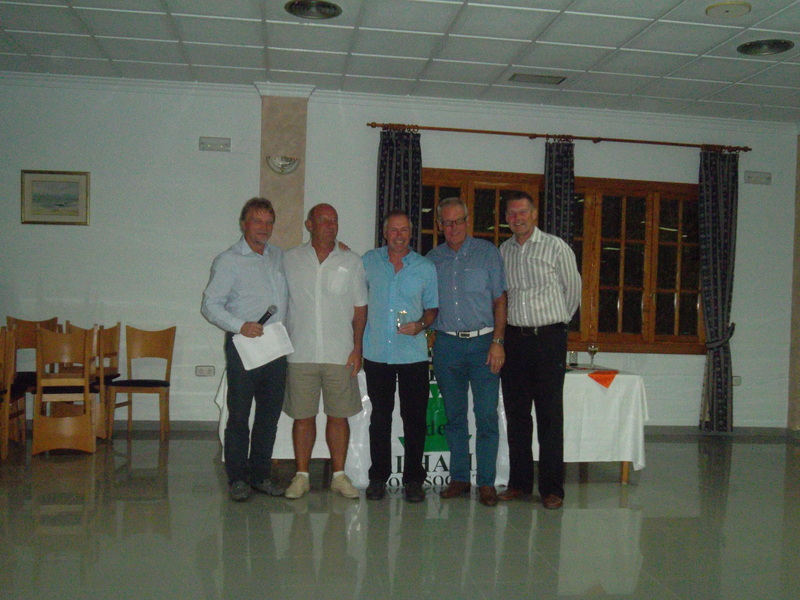 The bi-annual challenge against Mar Menor will take place 2 days earlier on November 5th at Condado. Global Golf intend to hold a competition to mark the opening of the clubhouse. This will be on 20th October and coktails and refreshments will be provided. 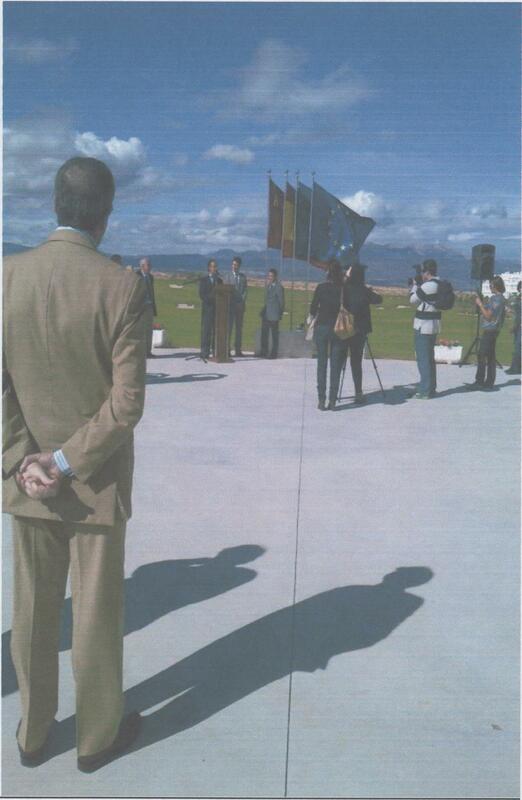 The mayor of Alhama de Murcia will be invited because they will have some involvement in the day. 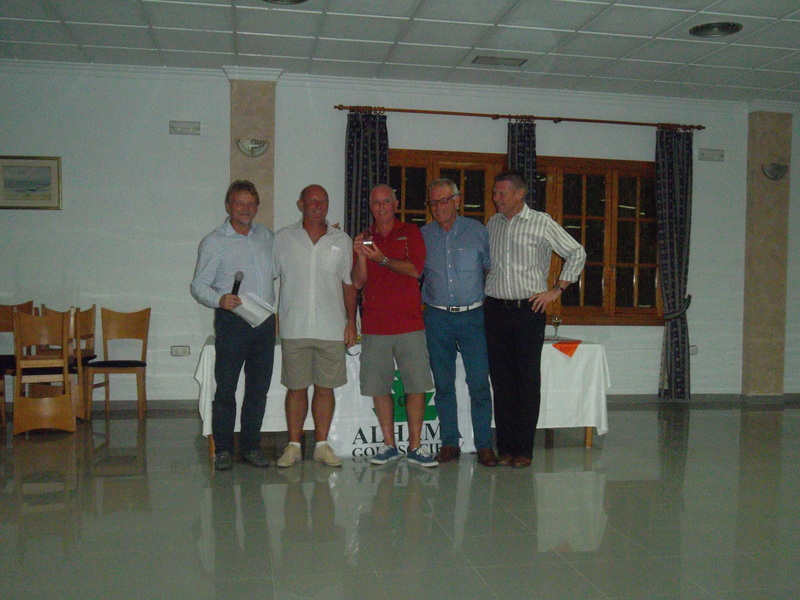 Aguilon Golf want to arrange a competition against us but the details are not finalised yet. 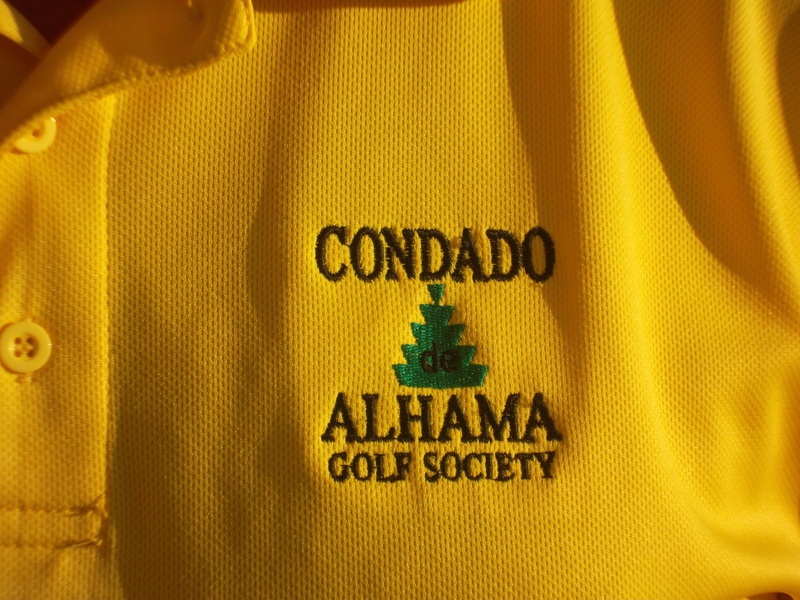 The management they will focus on promoting the Condado signature course in conjunction with the Nicklaus company, and may advertise our course as a one off experience, rather than part of the 6 course trail.